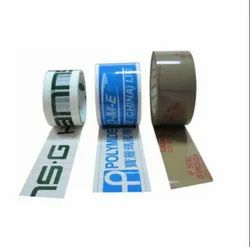 We are amongst the most notable names in the industry, offering wide range of BOPP Printed Tape that are quality assured and comes in standard thickness. 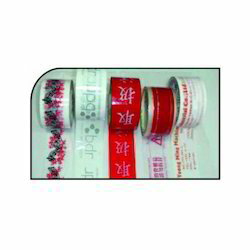 They can be easily used and thereby helps the packing more reliable and worthful. Our entire product range is water-resistant in nature and comes in varied patterns. Fostered with an automated production unit, we have been able to manufacture, export and supply Printed Tape. SUN PACKS's BOPP tapes are tamper-proof and are available in a variety of colours, thickness, roll lengths and roll widths (see specifications). We also manufacture custom-printed or signature tapes that can be printed with your company's logo or product name. This not only prevents tampering, it also provides companies a branding opportunity.